Exit I-95 at the Newtown exit. Take PA Rt 332 west. Follow the Newtown By-pass until it meets Rt 413 north. Following signs for Rt 413 north, exit the by-pass still following signs for Rt 413 northon your left. St Mark’s Church is located approximately 3 miles after leaving the by-pass on the right hand side of the road immediately after passing Stoopville Rd. Exit the Turnpike at the Rt 1 Philadelphia exit (27). Go north on PA Rt 1 to 413 north. Following the signs for Rt 413 north, continue on to the Newtown By-pass. St Mark’s Church is located approximately 3 miles after leaving the by-pass on Rt 413, on the right side of the road, immediately after passing Stoopville Rd. Follow PA Rt 202 East to PA Rt 413 south at Buckingham. Follow Rt 413 south past Rt 232 for about 3 miles. St Mark’s will be on the left. 6:00 PM Vespers or Vigil. 7:00 PM Vespers or Vigil (5:00 PM if on Sunday Evening). During Great Lent, evening services are at 7:00 PM and morning services are at 9:00 AM. A full schedule of Lenten services will be held including the Canon of Repentance to be held at 5:30 PM before the Great Vespers and Confessions each Saturday of Lent. For a complete list of upcoming services, please visit the Monthly Caledar on the parish website. St Mark’s Church was founded on November 15, 1972 by a small group of people who had in mind a parish open to Orthodox believers of all national backgrounds. 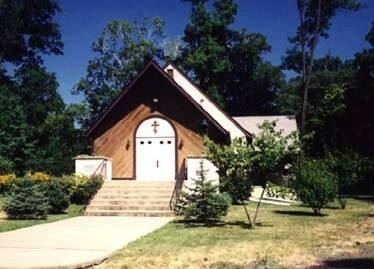 The first meetings and services were held at St Paul’s Episcopal Church in Doylestown, PA. In the earliest years some of the worship was held in parishoner’s homes. His Eminence, Archbishop KIPRIAN confirmed the name of the new mission as St Mark’s Church (the Apostle and Evangelist) on November 2, 1974. In July 1973 the Very Rev. Vladimir S Borichevsky was appointed to serve the parish, and the Liturgies came to be celebrated in Old Historic Trinity Episcopal Church in Buckingham, PA. Fr Borichevsky continued to serve the parish until he was appointed Dean of Faculty of St. Tikhon’s Seminary in 1977. Fr John Kowalczyk served St Mark’s from 1977 to 1979. He was succeeded by the reappointment of Fr Vladimir, who remained until 1986. On June 1, 1986, Fr Stephen Karaffa was assigned to the parish. Under Fr Stephen’s term the parish acquired its own property, some five acres of wooded land with a home in Wrightstown, PA (the present location). The grounds were cleared for a church edifice and parking area. Construction began in August, 1988, and on October 14, the new building was consecrated by His Grace, Bishop HERMAN. In September of 1992, Very Rev. Theodore Heckman, was assigned to St Mark’s. He served until the fall of 2012, and since December of 2012, the current priest at St. Mark’s is Rev. Raymond Martin Browne.